What do you get when you cross Star Wars, poker and web development? You get Brafton’s own Director of Technical Services Deryk King! Deryk’s humble beginnings at Brafton began back in December 2014, when he started on the team as a Junior Web Developer. All of his diligent work paid off in April 2016 when he was promoted to lead the team as its Director. Web development has long been a passion for Deryk, and he’s been putting his tech skills to the test for many years. Nowadays, Deryk helps our clients realize their web development dreams. 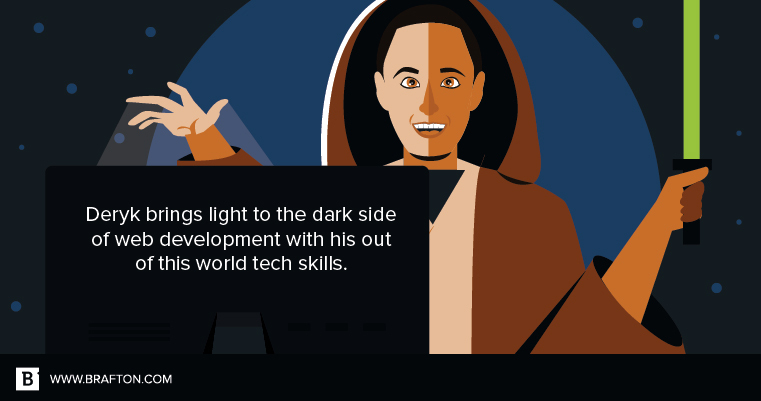 We like to think of him as Brafton’s web dev jedi – bringing light into the dark side of the development world. Since I’m bad at both Star Wars references and anything related to technology, I’ll let Deryk explain in his own words about what he does for our clients, and what it takes to succeed in the role. What do you like most about working on the Technical Services team and being its Director? The variety of technologies I get to work with. I have always been a “jack of all trades, master of none” so to speak, so this caters to my personality of wanting to know as much about an assortment of skill sets that I can. Can you explain a bit about what the Technical Services team does for Brafton’s clients? We do all manners of website work. Creating templates in various content management systems, plug-in/module development, creation of websites and web applications. We are mainly working on LAMP Stacks, which stands for Linux, Apache, Mysql, PHP. What are some of the hurdles the team faces? The steep learning curve of working with so many technologies. While also one of the benefits, it can be one of the largest pain points, as we need to learn on the fly, so to speak, to be able to work with so many clients using a variety of systems. What is one tech project you have loved working on? Refactoring (modifying code to be more readable and more efficient while maintaining the same functionality) and re-building some of our proprietary pieces of software, mainly our importers for various systems. That includes creating and implementing a proper versioning and error reporting system. What is something that you see clients request frequently in web development, but that you think should fade out? Homepage sliders and desktop hamburger menus! These are some of the items actually on their way out naturally, but they still get requested all the time. Banners are cleaner and more efficient since the average user doesn’t have the attention span for a slider. Pizza Hut’s slider might look appetizing, but is it enough to capture visitors’ attention long enough? And hamburger menus on a desktop are an abomination – they were the best solution someone could come up with back in the day to accommodate large menus on mobile and caught on. Things are moving to a more compact menu option only showing the important links on mobile devices rather than all the options in a hamburger. What about new trends on the horizon that you think companies should implement? 3-D and virtual reality. This is super exciting right now with most modern mobile phones having the capability to create some really interesting experiences for users. Large car companies are using this to great effectiveness in creating engagement, such as BMW. The next logical step is to harness this towards a marketing goal, i.e., generating leads and converting sales. In your opinion, what the required skills someone needs to have to succeed in web dev? The most essential is an eagerness and willingness to learn new things. Web development is forever evolving. Keeping up with all the different types of technology that are created and modified can be really overwhelming. If you don’t have an innate desire to learn new things you quickly become irrelevant. There isn’t a need to know everything, but a good knowledge of a wide variety of technologies is a must with a level of expertise in at least one or two, while keeping up with those technologies on a regular basis. What other creative outlets do you pursue in your free time? I play guitar and keyboard. I used to draw fairly well but that was years ago. If you could be any animated character from any TV show or movie, who (or what) would it be, and why? Batman. Because if you can be anyone, always be yourself… unless you can be Batman.